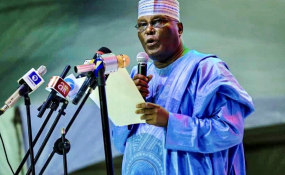 The presidential candidate of the Peoples Democratic Party, Atiku Abubakar, has given a victory speech and accepted to be the party's flag bearer in the 2019 presidential election. He described the convention as "a landmark event." The former vice president commended his fellow contestants "for displaying a sense of unity, a sense of purpose and a sense of commitment." "I am ever ready to work with each and every one of them for the realisation of the victory of our party in the forthcoming elections. "I cannot do it alone," he said. In paying tribute to Mr Wike and the government and people of Rivers State, Mr Abubakar said, "We look forward to working with you (Rivers governor and people) so that our party can be returned to power in the next election." He said he and PDP leaders "cannot afford to fail Nigerians at this very moment." In paying tribute to Mr Obasanjo, Mr Abubakar said he would not have succeeded as a presidential candidate if "President Olusegun Obasanjo had not made me his vice president." "Under his tutelage, I learnt quite a lot," he said. "I wish to pay my personal tribute to him." Mr Abubakar then pledged to the PDP chairman, Uche Secondus, "and members of this party that you will not find me wanting."